The first two home sites that MREC donated are located in two of its North Carolina master-planned communities, Kellswater Bridge in Kannapolis and Legacy Lakes in Southern Pines. LStar Management worked with MREC on both deals as its development partner. Ryan Homes built the first home in Kellswater Bridge and McKee Homes will soon begin construction on the second home in Legacy Lakes, both with financing from MREC along with contributions from The Patriot Charities. The Legacy Lakes home will be awarded to Sgt. Jonathan Rivenbark and his wife Yulia at a groundbreaking ceremony in late September. MREC got involved with the Helping a Hero initiative in late 2013 when it broke ground for the first home located in Kellswater Bridge. 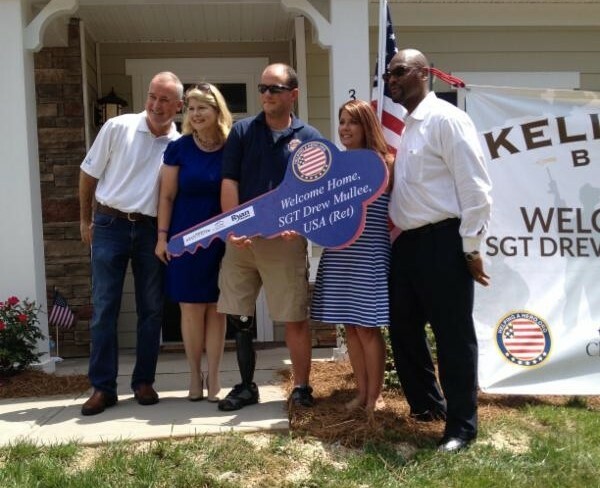 In June, a ceremony was held to award the keys for the first home to Sgt. Andrew Mullee, USA (Ret.). Mullee was injured in an improvised explosive device explosion while on deployment in Afghanistan with the U.S. Army, resulting in the loss of his leg and multiple other injuries. Mullee has already moved into his new home with his wife, Jennifer, and their one-year-old child, and is continuing to undergo rehabilitation. Rivenbark joined the U.S. Army at the age of 17. During his second deployment to Afghanistan in early 2012, Rivenbark was injured by gunshots while his unit was ambushed on patrol and suffered a fractured upper and lower leg along with multiple other injuries. He is currently in rehabilitation at Womack Army Medical Center and expects to medically retire from the Army in late 2014 to early 2015. In addition to MREC’s effort to give back through the Helping a Hero initiative, Fioretti along with his brothers Robert and John were instrumental in creating the real estate program at their alma mater, Lehigh University in 2006 along with an endowment to provide scholarships for students in the program. The goal of the program is to develop leaders whose knowledge, drive, vision and high ethical standards will inspire superior performance in the people and the organizations they lead.